There are ticket barriers at the entrance to the subway. If the gates are closed there are always staff on duty who will, when asked, let visitors to and from the railway centre through the gates. When the gates are open visitors should walk through. Please retain your railway centre tickets to show if required when leaving through the barriers. Visitors arriving by train can walk straight to the railway centre without going through the ticket barriers. Didcot is 53 miles west of London, 10 miles south of Oxford and almost halfway between London and Bristol on Brunel's original Great Western Railway. The Railway Centre is signposted from the M4 motorway (junction 13) and the A34, and is easily reached from the M40, or you can choose a scenic drive through the Thames Valley or across the Berkshire Downs. 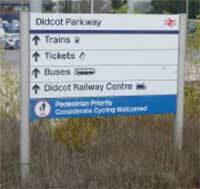 Parking is readily available near Didcot Parkway railway station. The brown road signs direct you to the main station car park, known as Didcot Foxhall where a new 1800 car Multistorey Car Park has recently been opened. This car park is a little way from the Railway Centre, involving a long walk over the new covered bridge. The bridge does however have lift and ramped access so is fully accessible, but signage at the new car park is, as yet, rather sparse, for which we apologise. If you do use this car park please, once you have paid, exit the car park at footbridge level (level 2), cross over the railway and the path will lead towards Didcot Parkway station from where you will see the signs for us via the station subway. The main station car park also has a height restriction of 2.35m or 7’6”. Great Western Railway trains serve Didcot Parkway with direct services from London Paddington, Reading and Thames Valley, Oxford, the Midlands, Swindon, Bath, Bristol and South Wales. For more public transport information see Traveline South East.